Here is a gorgeous little Sargent to stoke your Spring Fever. 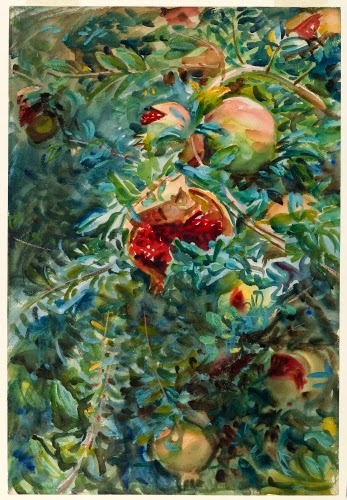 You know, I never come across a Sargent watercolor I don’t like. Just looking at this beautiful work makes me feel as if there is a warm breeze on my face. Some art historians may doggedly ride that worn out horse of Sargent as the “best portrait painter of his generation,” but, as I feel about Winslow Homer (1836–1910), his watercolors are BY FAR the most brilliant part of his marvelous body of work. Paul Cézanne (1839–1906) once said that Claude Monet (1840–1926) was “just an eye, but God, what an eye!” in relation to what he (Cézanne) felt about the restrictions of Impressionism. Well, I say the same thing about Sargent’s watercolors. John Singer Sargent is such an interesting person, and unlike many who became successful flattering wealthy people in portraits, he doesn’t seem to have had such a big ego. Like Monet, he always sought to grow as an artist and try new things. Born in Italy of American parents, Sargent learned early in his studies as a painter under the French pseudo-academic, fashionable portraitist Carolus-Duran (1837–1917). Carolus-Duran introduced Sargent to the idea of painting immediately without executing numerous studies in order to achieve a fresh, authentic depiction of a subject, and exploit the possibilities of a lively surface in oil. This idea was reinforced when he met Monet in the mid-1880s, painted outdoors (en plein air) with him and exhibited with him in 1885. 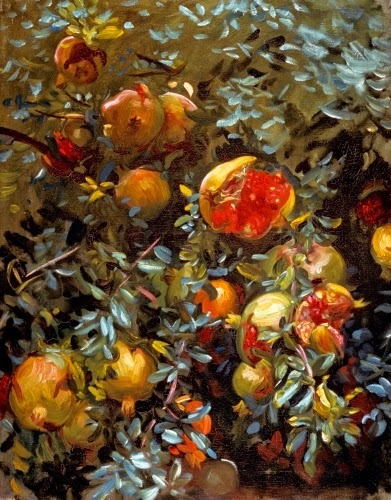 Although Sargent exhibited subjects other than portraits in the Salon in Paris, he never achieved the recognition with his other subjects as he did with his portraits. His fashionable portraits of the wealthy came to define his career. The 1890s were Sargent’s busiest and most lucrative years of portrait painting. By 1900 he tired of the artifice and formulaic nature of depicting wealthy sitters and he turned increasingly to watercolor. In taking up watercolor, Sargent returned to emphasizing painting outdoors. Between 1900 and 1914 he created over 700 watercolors, painted almost entirely outdoors, in brilliant pure colors with virtually no pencil outlines. Abundant numbers of watercolors were produced on trips to Italy, Corfu, through the Swiss Alps, in Spain and in North Africa, as well as in the American West and Florida. This study of pomegranates came from a trip to Spain in 1908, where he made numerous sketches and watercolor studies of the exotic fruit. Not only does he brilliantly explore the opaque possibilities of pure watercolor hues, like Homer, he uses the lightness of the paper to aid in his highlights, rather than using white gouache as highlights. He also painted the subject in oil. In the US in 1909 he had the first of only two exhibitions of his watercolors. He showed 86 works, 83 of which were bought by the Brooklyn Museum, an astounding purchase of art from a living artist working in what was considered at the time to be a “minor” medium. The fact is, because of the emphasis on watercolors by Homer and Sargent, the medium had found the path to asserting itself as a standalone medium in fine art. It was no longer merely a study medium. I think we would be hard-pressed to think of any other artists in the Western world who worked so diligently in perfecting their work in the watercolor medium as finished works.